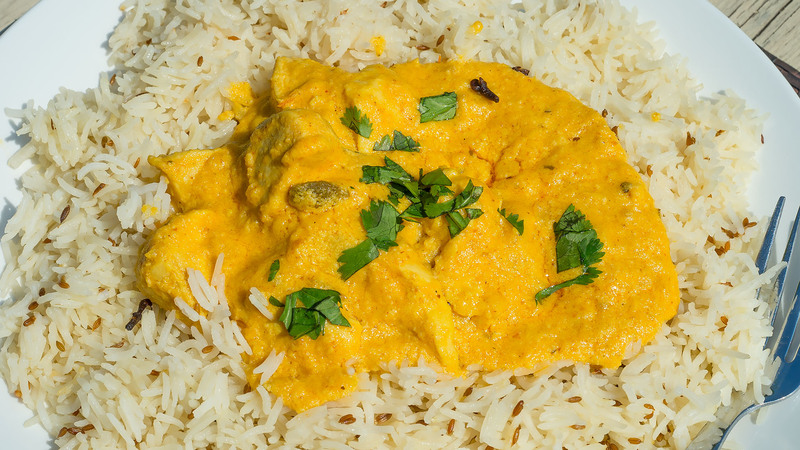 This recipe will produce an authentic Korma - just like the one from the take-away! 1. Cut 1 onion into quarters, cut the tomatoes into halves, chop the green pepper, ginger, garlic clove, and a little coriander. Put these ingredients in a small saucepan together with 4 tbsp oil, 1/2 tsp turmeric, salt and a cup of warm water (200/250 ml). 2. Cover with a lid. Gently boil until the vegetables are soft (approximately 15/20 minutes) stirring occasionally. When cooked, cool a little, then place in a blender to make into purée. 1. Heat 7 tbsp of oil in a medium sized sauce pan. Add the green cardamoms and the bay leaves and slowly fry. Add the rest of the onions (finely sliced) with salt, and cook to soften (stirring continuously). 2. Add the curry paste and cook for 2/3 mins (stirring continuously). Add the already blended puree and cook for a further 3-4 mins covered (stirring occasionally). 3. Add the chicken with a little warm water (around 100-125 ml) and on full heat, bring to boil and then cook for around 3-4 mins (covered and stirring occasionally). Turn back to a moderate/low heat, leave to simmer (covered) for 30 mins stirring occasionally. 4. Add the coconut cream (this should be grated), sugar and the single cream and bring to boil then leave to simmer for a further 10-15 mins (stirring occasionally) or until you have the required consistency. 5. Add more water if you prefer more sauce, or cook on a higher heat slightly longer with the lid semi opened for a thicker sauce. 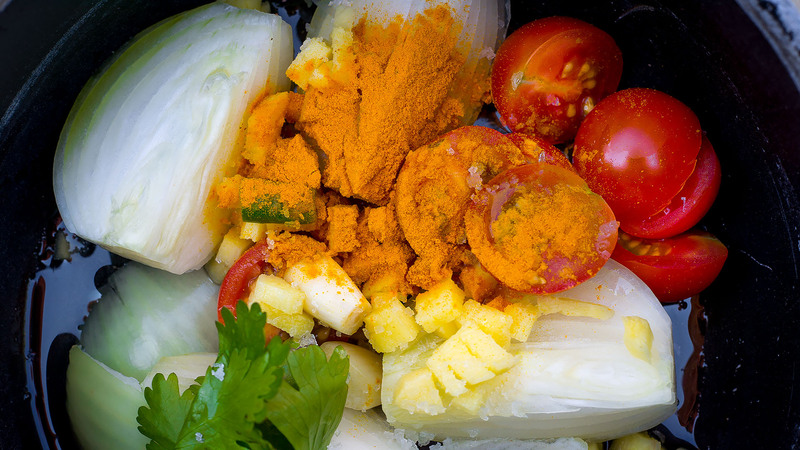 Once cooking is over add the knobs of butter, stir and leave the curry to settle for 10-15 mins before serving. Garnish with a little cream on top and a few leaves of fresh coriander. 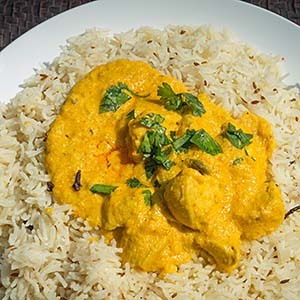 If you prefer a milder or more coconutty taste to your Chicken Korma simply add a little more cream and sugar or more coconut cream. To make perfect rice, use 3 cups of water to 2 cups of rice. Heat some butter in a pan, toss in the rice and a heaped teaspoon of cumin seeds, and fry it over medium heat for about a minute. Add the water and a couple of pinches of salt, stir briefly, cover and bring to the boil. Once it is boiling, turn the heat right down and simmer for ten minutes. Then remove the cover and simmer on lowest heat for another five minutes. There should be no water left in the pan, the rice will be separate and not sticky because of the butter. It is ready to serve. For extra fragrance, add a few cloves, star anise and a squeeze of lemon during cooking.